The Scottish Venison Partnership has welcomed Cabinet Secretary Richard Lochhead’s announcement made on Scottish Venison Day 4 September of a significant funding package to enable two deer demonstration units in Scotland to be set up. The UK venison market is recording growth of up to 20 per cent per annum plus, although Scottish venison’s share of this is reducing through a static annual wild red deer cull and not having developed new deer farming enterprises on a scale to input significant volumes into this market. Scotland produces in the region of 3500 tonnes of venison per annum of which just 50 tonnes come from farmed deer. 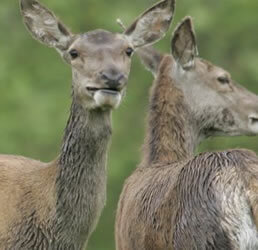 New Zealand by contrast produced just under 23,000 tonnes of venison in 2011/12. The Scottish Government, through the Skills Development Scheme, will be injecting £96,500 over two years into a total £131,000 project, the balance coming from in-kind contributions from the project partners and the Venison Advisory Service. The bid for funding, led by Scotland Food and Drink, was assembled by a small working group including the Scottish Venison Partnership, NFU Scotland and SFQC. “We are extremely grateful to the Scottish Government for enabling this venture which is the first small step in what has been billed as a new dawn for deer farming in Scotland. We believe that there is a tremendous future for Scottish venison and these two demonstration units will be vital in providing a lot more information to those interested in diversifying into deer farms or parks, or indeed starting from scratch. The demonstration unit project will involve a series of day-long visits to a selected deer farm over a 12 month period to cover all aspects of the deer farming year. These will involve both seminar activity and hands-on practical demonstrations and experience. The programme will be supported by an online manual and run as a sub-domain of the Scottish Venison Website, which also hosts the Deer in Scotland Education Zone for schools developed by SNH. Year 2 will be based at a different location and focus on deer park production, but with a similar approach. The project target is to reach an audience of 200 prospective new venison producers or breeders/finishers over its two-year period. A selection process to identify the two participating units will run shortly with the programme commencing in early 2014.